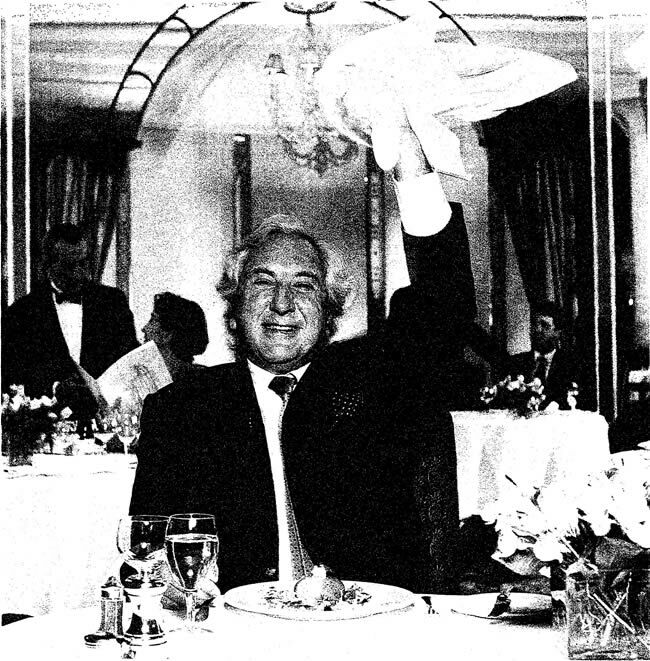 Restaurant staff beware: when the soup's cold, the table wobbles or the fish is off, you'd better pray it's not Michael Winner you're serving. "You know, Mr Winner," said Gino, the owner of my excellent local Italian restaurant, Cibo, "when you come in, ees like 45 people come in." "Only 45, Gino?" I replied. "I would have hoped 60 at least." Gino thought for a second. "You and Harold Pinter," he said ruminatively. I don't know if Gino was insulting two of his best customers, but I think Harold and I are absolutely right. If you're paying good money and in most restaurants I go to, I pay a lot of very good money then you may as well keep them on their toes. I'm delighted that Pierre Koffmann at La Tante Claire recently got his third Michelin Guide star; he wouldn't have got it for service the night I was in. I did think the food was terrific, even if Miss Seagrove found her duck somewhat awful. We were a party of six, as they say in the trade, and the service had been sloppy. The bread arrived at the end of after the first course. When we finished the main course, the dirty plates sat uncleared. That always annoys me, but I was a guest: I said nothing. Eventually a waiter took three plates away. My host, a quiet American who was something terribly important at Sony Music, murmured: "I see they have a strange habit here, they only clear half the table." My left arm shot upwards to beckon a waiter. He gave me a look that said: "At La Tante Claire you don't call us, we call you." "Excuse me," I tried another waiter. He ignored me, too. I got up, lifted the knife and fork from one of the dirty plates, I put that plate down a bit noisily on top of another plate, crashed the knives and forks on top and walked calmly through the restaurant. All eyes were upon me. A silence descended. I was heading toward the kitchen door. I'll tell Pierre things are a bit dodgy out there tonight, I thought. Then I thought, just my luck; as I get to the kitchen door it'll swing outwards, straight into me, I'll drop the plates and my gesture will end in fiasco. I veered right, through an arch, to plonk the dirty plates on the bar. A waiter was already taking the remaining plate from the table when I walked back. For the rest of the evening the service was immaculate. There are a number of good ways to get attention in restaurants when waiters ignore you. A fairly crude one which I'm not averse to using is to smack the table-top loudly and shout: "'Ere!" Another, as a waiter sails by, is to call out: "Middle." There's something about the word "middle" that spins them around. The best method, which I use a great deal, is to raise my napkin in the air, arm outstretched above the head, and wave it around slowly. That always gets them. The least enjoyable worst restaurant evening of my life was at Sir Terence Conran's Pont De La Tour. I was again the guest of the American music supremo; Chris Wright, the chairman of Chrysalis Records, was with us. An evening of tepid food, of unremarkable quality, and poor service was rounded off with a remarkable performance by one of the most unrepentant managers I have ever come across. Everything had been appalling. The food was cold, the service rotten. One guest wasn't served until everyone else had virtually finished a course. My fish came without any vegetables; it tasted old and tired. We'd ordered coffee and after a while I saw two young waiters staring in confusion at a tray with cups on it. I suspected knew they couldn't work out which was decaffeinated and which wasn't. After a while, I looked again. They were still staring. Eventually they took a chance and served it. "This coffee's cold," murmured my quiet American host. I shot up. The manager, resplendent in evening dress, was way down the restaurant. I walked over. He saw me coming and headed for the cash-desk. "Excuse me," I said. He seemed to ignore me. That was a mistake. "Excuse me," I said again, a bit louder. He kept walking. "Excuse me!" I yelled. When I yell you can hear it 60 miles away. He turned. "We're having a terrible time at our table," I said with quiet venom. "I suggest you come and deal with it." He followed me back. His name was Andrew Carson. I pointed out that the coffee was cold and asked could he get some more. Things were not going well and one guest By now, all the guests were fed up. One mentioned my fish. This clearly upset the manager. Mr Carson froze. "What was that?" "It's not important," I said. "Let's just have some hot the coffee." But that was a forlorn hope; the manager wanted to know "what was wrong" there and then. "If there's anything wrong, I want it out right now," he said. Oh, dear, I thought. I told him my fish had been solid and unfresh. He protested at length started a tirade about how fresh everything was. Always. Inevitably. The wife of our host, trying to calm him, things, said how nice the place usually was, what famous rock stars she'd brought, but how tonight we'd all thought there had been a collapse of service and quality. "I shall go to the kitchen and discuss this," said the manager, Mr Carson, walking off with all the neurosis of Basil Fawlty. He returned with a delivery note. "That proves the fish was fresh this morning," he said. Of course it proved no such thing. "Ah well, perhaps it was overcooked," I said. The manager Mr Carson stormed off again, returning to whisper in my ear: "The chef was very satisfied with your fish." "Well, he didn't have to eat it," I replied. I wrote to Sir Terence, detailing how a distressing meal had been turned into a remarkably unpleasant evening by the quite extraordinary antics of his manager. horrible it had been for the eight of us. Unlike other restaurateurs I've written to, Sir Terence replied sarcastically: seemed deeply uninterested. "Thank you for your film script. I shall certainly investigate the situation." I did not hear from him further. Even your favourite places can have an occasional lapse. I've always considered Claridge's one of the best restaurants in London. Good, plainish food, excellently cooked and presented in grand surroundings reminiscent of a ship's ballroom. But one Sunday lunch was a disaster. Everything went wrong, from thickly cut, salty smoked salmon to poor service. Then came the Yorkshire pudding, so dried-up you needed a hammer to make an impression. I went berserk. "Luigi," I said loudly to their brilliant second-in-command. "How dare you serve me this!" Luigi smiled the marvellous half-smile he uses for naughty children. "I'll have some freshly made," he offered. "I don't want any, just wrap this," I said. "I shall send it to Giles Shepard (the chairman of the Savoy group) in the morning." Luigi duly returned and took the offending piece of Yorkshire pudding to wrap it somewhere discreetly. "Don't take it away! Wrap it on the table," I yelled. I went home with my piece of Yorkshire pud. But there was a problem. I couldn't really send it to Shepard because a few months earlier I'd written to him complaining after I had found the Savoy car park locked at midnight, with a sign saying "Gone to lunch back in 20 minutes." I'd had to wait forever in the dingy, dusty tunnel leading to the car park before the attendant returned, driving like a maniac in what was presumably a customer's Volvo. Giles had given a donation to charity to mollify me. It seemed a bit much now to send him this Yorkshire pudding. So I wrote instead to Mr Ronald Jones, Claridge's general manager who had recently been photographed with the other general managers of the Savoy Group, then fighting off a takeover bid from Trusthouse Forte. "It's no good posing for photographs," I wrote, "stating the excellence of the group's hotels in your attempt to fight off the Forte camp, when, if the service and food are anything like I received yesterday, a takeover by the Pizza Hut would be divinely welcome. I enclose for you, carefully wrapped, a piece of so-called Yorkshire pudding. If you think it looks in a sorry state now, I can only assure you it was even worse when I received it on Sunday." Mr Jones took this all in good spirit and, as requested, refunded the cost of my lunch to a charity. A few days later I was at a Joan Collins cocktail party at Claridge's when Giles Shepard came over. "I see you wrote me another letter, Michael," he said. "No, I didn't, Giles," I replied. "I specially didn't write to you in case you thought I did it for a living." "All the letters come to me anyway," he said, charmingly. Sometimes it isn't the restaurant but the customer that is reason for complaint. On one particularly horrifying visit to the superb food at Raymond Blanc's Le Manoir Aux Quat' Saisons in Oxfordshire, a small child sat opposite me with his parents. He spent the entire time yelling, screaming, shuffling and finally walking round the room opening and closing the cupboard doors on the central serving table with a loud bang. I don't write very often to restaurants, but this deserved a Winner missive. "Dear Raymond," I wrote. "Apart from the fact that I got a different main course to the one I ordered (which was delicious anyway) the pleasure of being in your tranquil and beautiful house was severely tested . . . it seems a pity to create an atmosphere of such calm and beauty to have it made traumatic by that terrible noise and disturbance . . . After all, if I had spent the lunch hour yelling and screaming and slamming doors I have no doubt I would have most properly been asked to leave." Blanc was his usual charming self in reply. He apologised, but added: "Being French, we do welcome children and I have no misgivings about this . . . I hope this will not deter you from coming back, and we will ensure there are no children nearby when you join us." I felt like writing back that being French, Raymond was brought up on French children in restaurants. They are always, however young, extraordinarily well behaved. Not so their British counterparts. Actually, I don't go to restaurants, I go to tables. It's no good the food being wonderful if you're squashed up in some tiny space closer to the people on either side of you than to your own companion opposite, so I always note the number of the table I like (all restaurants give their tables numbers), and if I don't get it, I go somewhere else. I'm very seldom prepared to sit at a table meant for two people, even if we are only two. This makes it dangerous to go anywhere new. I sometimes walk out within seconds. I suppose you could say I'm not easy. Worst of all is when the restaurant instructs you when to turn up. Miss Seagrove and I decided to try out L'Ortolan in Berkshire, having read good things (seldom reliable) of its chef John Burton-Race. I was asked to arrive at 12.15 or 2pm. I chose 2pm, got there 15 minutes early and was shown to a terrible corner, where both the table and the chairs wobbled on an the uneven floor. The view was part garden and part parked cars. The food wasn't much better, and I remained unconsoled when Mrs Burton-Race told me explained that I was at the wrong table because I'd arrived early. Particularly as the table which had been meant for me had people who stayed until 2.45. On the way out, there were the most terrible screams and yells from the kitchen, but as Mrs Burton-Race ignored them. Did they, I fantasised, come from Mr Burton-Race?, I assumed they came from her husband running the ship with a firm hand! Eating out is quite a hazard, really. I've been served with what looked like a nut and bolt in my pasta at Mosimann's when I complained, the head waiter said: "It came from the kitchen: we're doing some building." "I didn't think it came from Harrods," I replied. We got four free champagne cocktails for that, but since we'd finished our main course, they seemed a bit inappropriate. At Kensington Place, on a day things had come to a halt, I ended up serving the entire restaurant with bread. I was so keen to get some for myself, I got up, took the basket from the serving area and then helped out Alan Yentob, who was sitting some distance away. At that everyone called out for "service", so I did the whole room. I don't go to the Ritz any more, since the day I ordered orange juice, got some foul-tasting muck and chased the head waiter to centre stage. "Is your orange juice fresh?" I asked. "Not unless you specially request it," was the reply. Standards aren't what they used to be. But if you think I complain too much, let me make a recommendation. Try the Magpie Cafe in Whitby. Miss Seagrove and I chanced on it by accident, when I was filming nearby. The freshest fish and veg you'll ever get, and lovely homemade desserts. I know it's a long way to go. But it's a rare spot. I never complained there. Most charming restaurateur: Marco Pierre White at Harvey's - attentive, polite, entertaining. Least charming restaurateur: Sir Terence Conran - surly, pompous. Best fish and chips: Dilt's Scarborough. Ultra-fresh fish, beautiful batter. Worst fish and chips: Royal Hotel, Scarborough. Fish hard, chips soggy. Worst setting: Beauchamp Place - pokey basement, ugly decor. Best meal I've ever eaten: Harvey's - remarkably inventive, fresh, flavours brilliantly brought out. Worst meal I've ever eaten: The Ark, Kensington High Street - dried-up chicken congealed gravy.